Perforation of the eardrum (tympanic membrane or tympanum) is a very common injury to the ear, often resulting from ear infection, trauma (damn those Q-tips! ), loud noise, or blockages in the Eustachian tubes. Most cases the damage is minor and the drum heals quickly on its own, but other cases bring about hearing loss, and consequently, the rupture requires intervention to correct the damage. By the nineteenth century, however, there were no effective surgical treatments for perforation of the eardrum or the hearing loss that accompanied it. But there were many, many remedies recommended by physicians and aural surgeons, all applying the idea that the rupture needed to be closed somehow, but still allow sound to funnel through the ear drum. Some measures included: India rubber, lint, tin or silver foil, the vitelline membrane of an egg. Adhesion of the apparatus to the ear were used with: saliva, water, petroleum jelly, or glycerine. Oh, that’s all, you say? Nope—how about cotton-wool inserted into the ear? Or onions? Pieces of fat bacon toasted over a candle then inserted into the ear along with some wax drippings? Pour some oil into your ear! Or when all else fails, just create your own homemade artificial eardrum with elk’s claw, pig’s bladder, fish bone, gold beater’s skin, or even some court plaster. Here’s when it gets interesting. 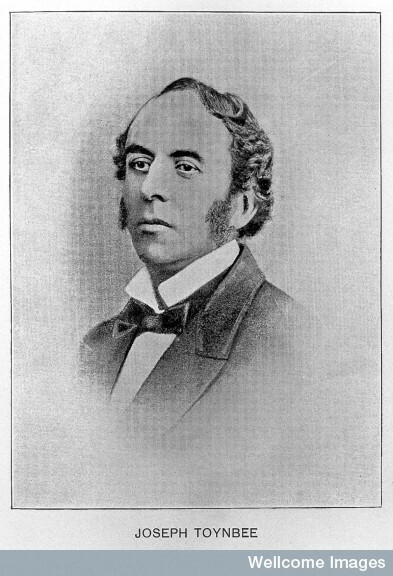 In 1841, the aural surgeon James Yearlsey—who had just enough of quackery in aural surgery, by the way, and was advocating medical and surgical reform—became acquainted with the idea of constructing a surgical apparatus to treat perforation of the ear drum, when a patient from New York came to London for a consultation. Seven years later, he published a paper in The Lancet describing his new artificial tympanum made with cotton balls applied to the end of extraction cords. However, whatever revolutionary sentiments Yearsley hoped with his innovation, were squashed by Joseph Toynbee (1815-1866), the charming and popular aural surgeon who once worked with Richard Owen at the Hunterian Museum. Toynbee is also father to the famous philosopher and economist Arnold Toynbee (1852-1883). Toynbee presented a paper on his artificial tympanum—making no reference to Toynbee—at the 1850 Annual Meeting of the Provincial Medical Association. His innovation was composed of gutta percha (natural latex made from South Asian trees of the same name—a very popular 19C material that eventually collapsed from overuse) or vulcanized rubber, attached to a silver wire stem about 3cm. Toynbee followed his presentation with a paper, “On the Use of an Artificial tympanic Membrane,” published in 1853, which earned him a medal from the Society of Arts. The guidewire was used to install the device into the tympanic cavity, adhering the rupture and still allowing sound to funnel through the fine tube. As you can imagine, Yearsley was outraged. Aural surgery during the 1850s was overwhelmed with priority disagreements between Yearsley and Toynbee, and many other enthusiastic aural surgeons chimed in their two cents on the efficacy of each of these new devices. 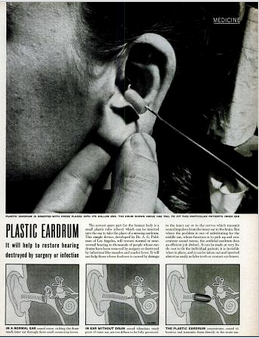 Further surgical advancements would later demonstrate that artificial tympanic membranes have little value, for over time, the eardrum just heals itself naturally, or else grafts are recommended in cases of serious ruptures. * Many thanks to Dr. Albert Murdy for the clarification. Eugene A. Chu and Robert K. Jackler, “The Artificial Tympanic Membrane (1840-1910): From Brilliant Innovation to Quack Device,” Otology & Neurotology 24 (2003): 507-518.